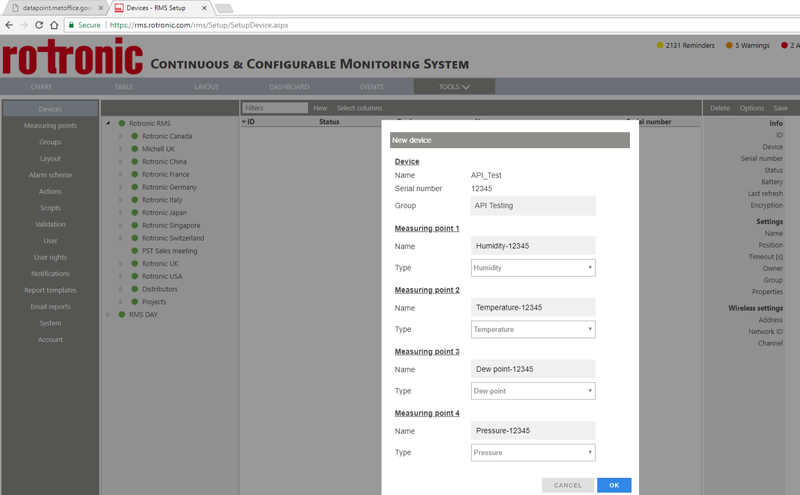 The latest Rotronic Monitoring System software has been designed specifically for the IoT and IIoT world. We have a wide and growing range of sensors, loggers as well as input and output modules but we will never keep up with the unique demands of our customers. 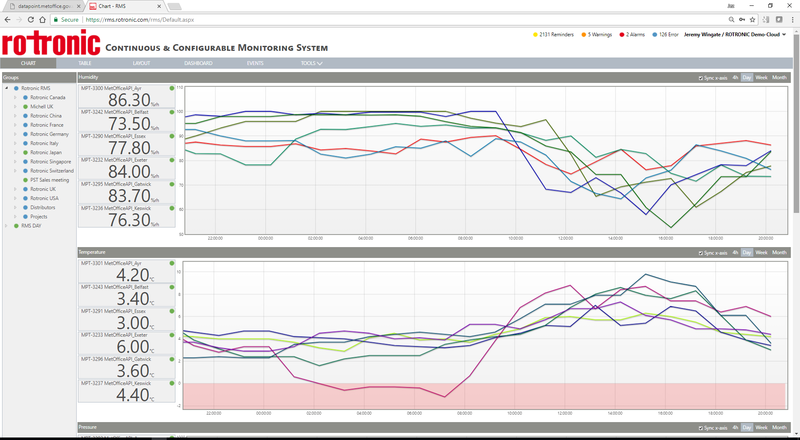 That’s where integration is key for any successful continuous monitoring system! Hardware can already be integrated via analogue input modules such as our 8ADC and digital devices can be integrated via our RMS-Convertor that can be programmed with custom protocols and functions operate with virtually any device. In addition to hardware, software integration is a must, and not easy when we consider RMS is a fully Gamp6 compliant system and therefore security and traceability is key. Why not access the SQL DB? All data on RMS is stored within an SQL database which with suitable rights can be queried easily to pull data out. However injecting data whilst possible triggers our system to report data manipulation. Also direct access to the database presents a security risk and uncontrolled changes to the system, and of course its not possible on shared systems. That is why we also offer a Restful API through which data can be posted only when configured by users with appropriate permissions and each data stream is securely linked to a onetime token, by no means the best security but suitable for many applications (and of course the whole API function can be disabled if preferred). We of course have software wizards at our HQ that can develop professional integration solutions but as a hobbyist I wanted to see what I could achieve. Step 1 – Get the data from Met Office API. The Met Office API is great you simply need to register to get an api key then get your head around the commands. Once you have that you can request the data you need via a simple url and the information is returned in xml or json format. url = ‘http://datapoint.metoffice.gov.uk/public/data/val/wxobs/all/json/3212?res=hourly&key=YOURKEY&#8217; #replace with your Met Office API key! This gives a Python dictionary with all the json data from which we can request specific values easily for example the latest conditions (no doubt there are more elegant solutions but this works for me). Adding new API device in RMS is simple process, we create the device and define the Name and Serial number. At this point RMS awaits an Post command in which the additional details are included. Using the Python code below I am able to create a device with 4 measurement points (measured values); Humidity, Temp; Pressure and Dew Point. 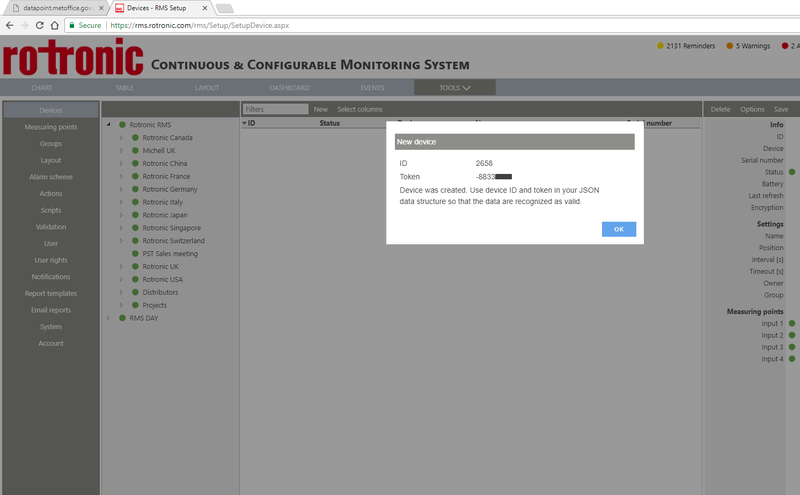 Finally RMS gives us the device ID and API token which must be included in any future post commands. Combining Step 1 and Step 2 allows us to simply replace my example values above with the real Met Office API data! Run the script hourly or permanently with an hour delay and we have a simple tool proving live data weather data! With the data in RMS we can easily graph values and create email, sms or phone alarms. Taking the API further I it is possible download live satellite imagery and dynamically update the layouts in RMS! So it turns-out getting data into RMS via the API is simple with a bit of basic code. 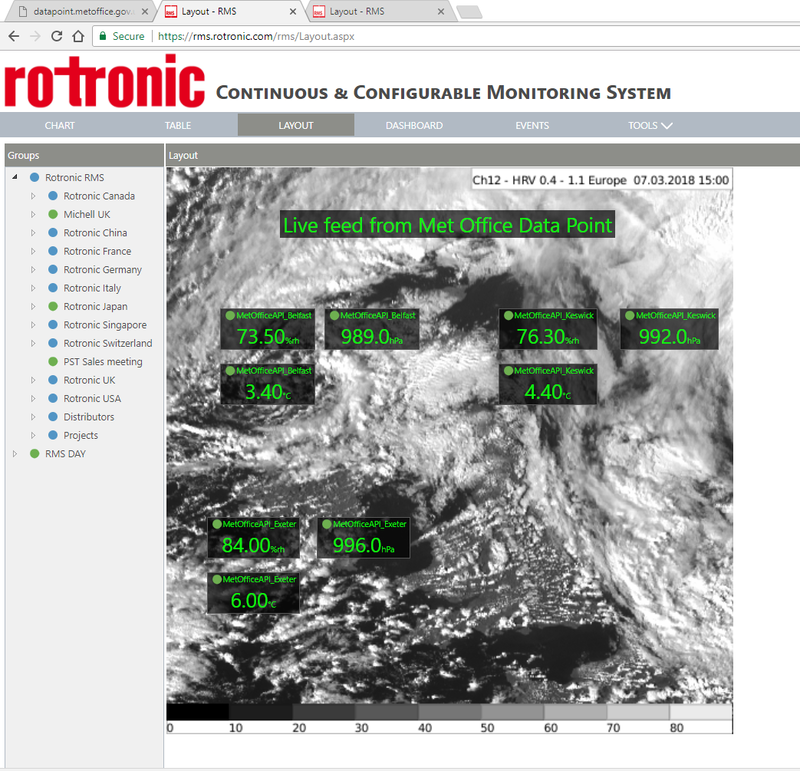 Of course Met Office data is just an example in modern industrial applications there is so much unique data from devices or software that might be of use and RMS aims to offer a complete monitoring solution not simply for our products! Be sure to get in touch if you have any questions on the above or have any monitoring requirements. Use the demo login above or visit out RMS website for more details. The Hohenzollern family came to Brandenburg 600 years ago, in 1415. Twelve prince-electors, seven kings and three emperors made Prussian, German and European history for almost 500 years. The women have been some what overlooked by historians, by turning the spotlight on them, the foundation for Prussian castles and gardens has paved the way to discovering hitherto unknown aspects of Prussian and European history. The foundation presents 300 exhibits from national and international donors in a an area of 900 Square meters, which include the oldest authentic woman’s dress in Brandenburg (c.1460) and the coronation cloak of Queen Augusta. The climate and lighting are the most influential factors to ensure the preservation of museum exhibits, because they can cause damage by accelerating chemical and biological degradation processes. In recent decades, the exhibition sector has developed a standard for conservation conditions in exhibitions. For those with the most varied works of art, temperatures of 18°c-22°c and relative humidity around 50 %RH with slight variations, and lighting of 50 to 200 Lux, are striven for, depending on the sensitivity of the materials. The theater in Charlottenburg has no central air conditioning system. The room climate is influenced by a massive building shell, with masonry walls some as thick as 80cm, solid, reinforced concrete ceilings and floors, and composite windows with double glazing. To reduce warming through sunlight, the windows on the south side have been given sunshades for the duration of the exhibition. The foundation has until now had no experience with using the building as an exhibition area. For this reason there were very high demands on the quality and availability of the measurement data. The concept for the exhibition combines a large number of works of art made of the most varied and sensitive materials, understanding of measurements is developed over days, months and years. Suitable for a wide range of humidity and temperature monitoring tasks, Wireless transmission – Possible over distances of up to 100m. Saves on wiring costs, and the data can be collected and recorded from inaccessible points quickly and easily. Thanks to the combination of wireless transmission and data logger, the greatest possible reliability against failure is ensured. 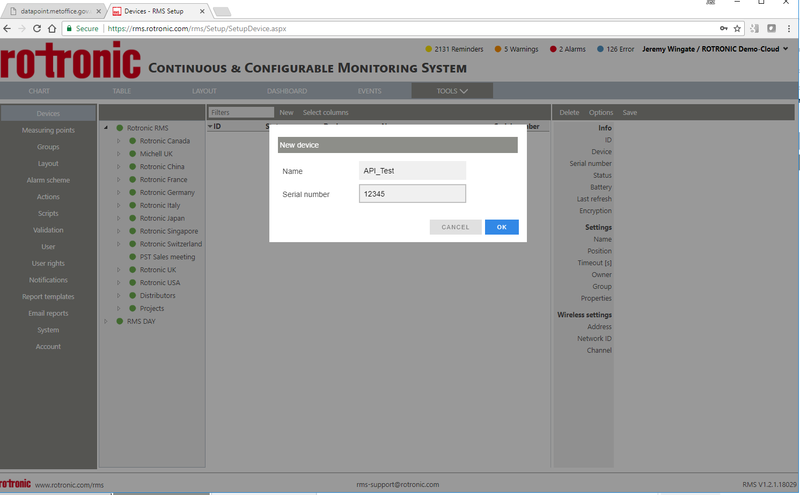 Devices can be configured and read out via the HW4 software and now our latest web or server enabled RMS software. Application uses include: Meteorology, Food Industry, Building Technology, Museums, Environmental/Laboratory equipment, research an development, Pharmaceutical/chemical/logistics and textile industry. To monitor the climatic conditions reliably and flexibly, HL-RC-B wireless data loggers are used. The measured values are recorded locally and safe from manipulation in a memory with a capacity of 500,000 values. With no cabling requirement, and without provision of an infrastructure such as a LAN or power outlets, the loggers are mounted unobtrusively on walls and in glass cases, thus impinging only minimally on the exhibition concept. Why do we need Warehouse Mapping? Rotronic is proud to be able to offer an increasing range of products and services to meet the demands of our customers. The requirements for mapping especially thermal mapping are increasing dramatically in food, pharma and cosmetics production and transport industries. But what is Thermal Mapping? Mapping is the process of determining the temperature and often humidity gradients within a defined space. It is a vital process when the product is regulated by government agencies such as the US Food & Drug Administration (FDA) or the European Medicines Agency (EMA). Regulated materials must not exceed strict storage conditions. Fixed limits will typically exist for humidity and temperature both in terms of the absolute value and also the allowable rates of change. Mapping serves as a baseline for proving compliance within the storage spaces. The reason for increasing regulatory compliance is to ensure products do not spoil or otherwise degrade during production, storage and transport. Warehouses are notorious for having warm or cold spots that are outside of the regular control specification. A proper mapping study serves to locate these spots and either modify or avoid the problem area. Similar problems can occur during transportation so increasingly transport is at least monitored if not fully controlled and mapped. At 4.3 million square feet, the largest warehouse in the world is the Boeing Everett factory in Everett, WA USA. It was originally designed to construct the Boeing 747. An FDA Form 483 is issued to a company’s management at the conclusion of an inspection when an investigator(s) has observed any conditions that in their judgement may constitute violations of the Food Drug and Cosmetic (FD&C) Act and related Acts. A mapping strategy is needed for several reasons. It is important for regulators or quality managers to understand the philosophy employed for the mapping. A documented strategy will decrease questions from any regulators reviewing your mapping study. The strategy document also helps them understand the data that is produced by the mapping process. The document acts as a tool for collaboration as other people may suggest ideas that will make your study produce better data or make your effort more efficient. As the mapping study progresses from start to finish, the strategy document acts as your reference guide, ensuring you remain true to the agreed upon process and do not make changes that will negatively affect the study. A typical strategy is usually comprised of a few written paragraphs that includes a description of the warehouse space, the type of equipment used, the number of sensors to be used, a general idea of the sensor placement, and the duration of the study. It is not unusual for the mapping strategy to change as it evolves. Writing a detailed document at the early stages of the project may cause re-writes that can increase the total length of the project. It is usually more efficient to fully document the warehouse mapping project after the strategy is agreed. Think of the strategy document as a proposal for your mapping team or the approval team so they can buy into and understand your mapping strategy. It may also facilitate the final approval stage, later in the project, because the auditor already understands the warehouse mapping project. 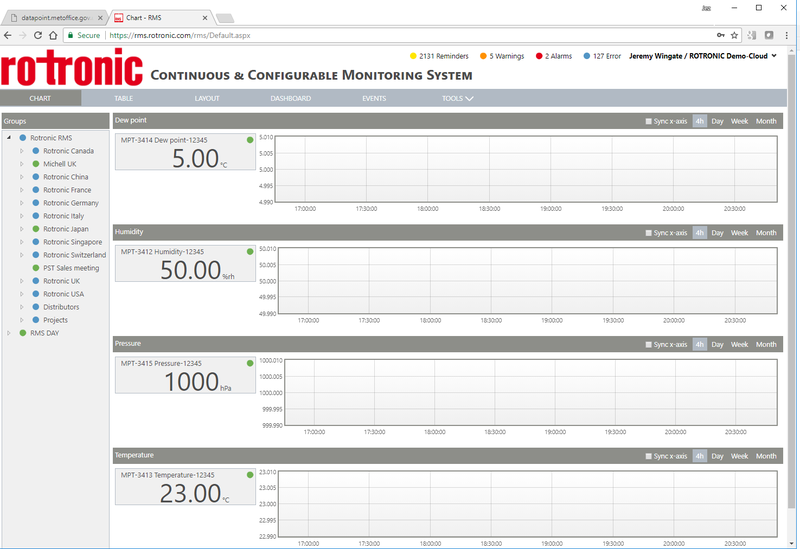 Continuous monitoring is a best practice within controlled and regulated spaces. The mapping study will determine the hot and cold zones for “worst case” sensor placement. These worst case locations should be considered when installing a permanent, continuous monitoring system. The number of sensors used for a permanent system will be far fewer than what is required for the mapping study. In some cases, continuous monitoring may require only a few sensors once the problem areas have been determined through the mapping study. 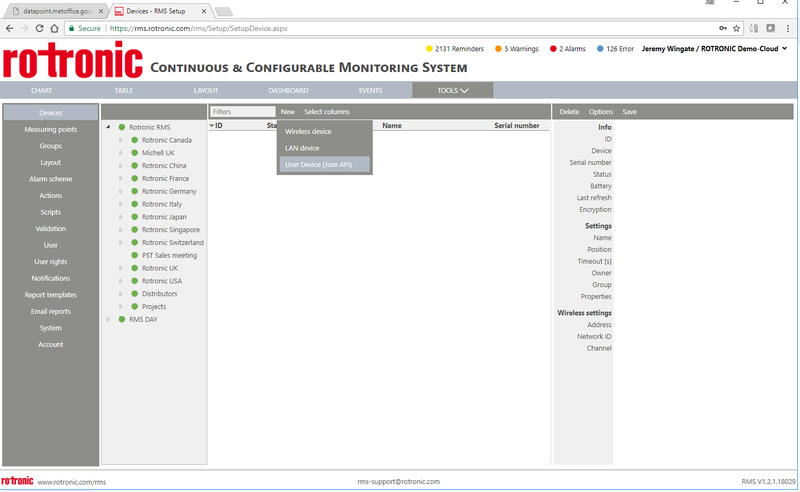 A continuous monitoring system offers peace of mind as product components, manufacturing space, or storage space are maintained and on record as meeting specified environmental conditions. If you have any queries regarding warehouse mapping feel to get in touch and we will be happy to discuss!